I'm expecting an obscure Breaking Bad reference, Dan, but we shall see. Ok, here's my big question -- are we still going to get an RT version, and if so, will MS mostly avoid using the name "RT" as it did last time for the Surface 2? And here we go, it's Satya Nadella! "It's good to be on a different coast this time. I want to talk about our devices today, but I want to start by talking about the journey that we've been on." "Over the last couple of months you've seen us talk about various aspects of this strategy." He's starting by talking about the cloud, how it enables services on "every device." Starting with the CEO might be seen as a vote of confidence for Surface within MS. 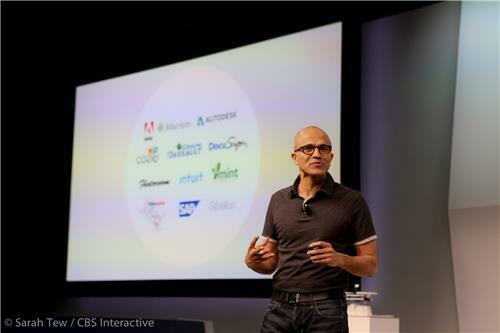 Put another way, if Nadella wasn't here, it would look odd. He's now referencing the BUILD keynote, including the advances in Windows and Azure. 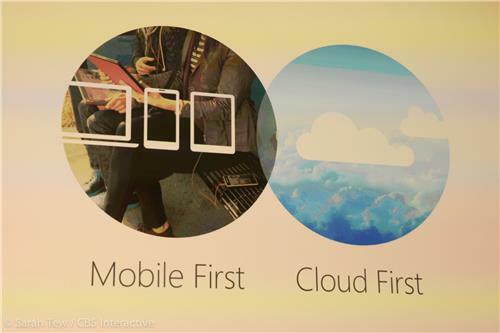 Talk starts with Cloud and other "soft" concepts, rather than hardware. 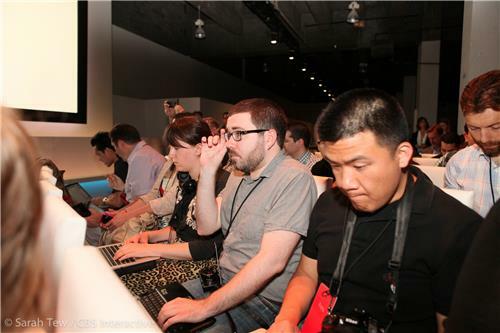 "We were advancing on every dimension, from form factors to business models for both people, IT, and developers. Today is the next step on that journey." "It starts for us with this obsession with empowering every individual and organization to be more and to do more." "Do more, be more" is the mantra of the day by the sound of things. He wants people to "Dream and get stuff done." To "get more out of every moment of their life. That is the mission that we're on." 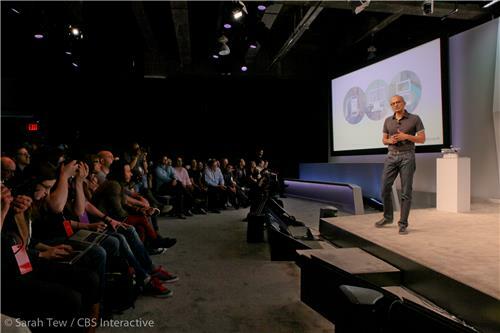 Nadella says that Microsoft has looked at people, to see what they do in the real world, how they use their devices, "a busy professional or a parent." 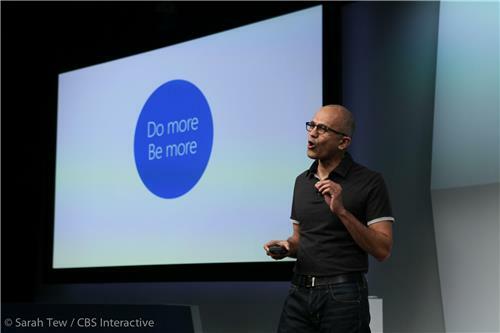 "All of those activities act as the motivation for what we want to do at Microsoft. That's what has led us to build the ubiquitous software products that we have built to date." OneNote, Office, Skype, and OneDrive are the company's way of extending this sort of functionality across all devices. Now a list of a bunch of other companies that are building on top of these solutions. Companies like SAP, mint, Intuit, etc. 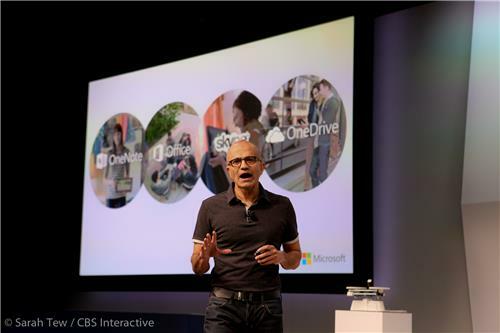 OneNote, OneDrive, Skype, Office 365 -- lots of brands/brand names. And that's before we get to the hardware. "The question that needs to be asked and answered, is why hardware." Haven't we discussed this before? "We're clearly not interested in building refrigerators or toasters." He wants to build "mobile-first productivity experiences." "We are building new strength and capability around that alchemy of bringing hardware and software together. The Nokia close really gives us extra strength to do that together." Microsoft says it's not building hardware for hardware's sake -- it's important to have your plan worked out when you're essentially competing with PC makers in the same business. "We are not competing with our OEMs in hardware. In fact our goal is to create new categories and spark additional demand across the entire ecosystem." As if on cue, Nadella says MS is *not* competing with OEMs. Except that they totally are, of course. "Today is a major milestone in that journey." -- He's asking whether you can build a device that "Takes the best of the tablet and the laptop." Hasn't Microsoft been saying that's what Surface is all along? "That's the device that we want to create. That was the motivation in the Surface line, and today we have a major step forward in that dream and vision." Time for Panos Panay to come up on stage! Panos just threw me a peace sign, so that's cool. Make a device to "watch a movie or create a movie." I feel current products can do a pretty good job of that -- is the create/consume split still a a major problem for people? 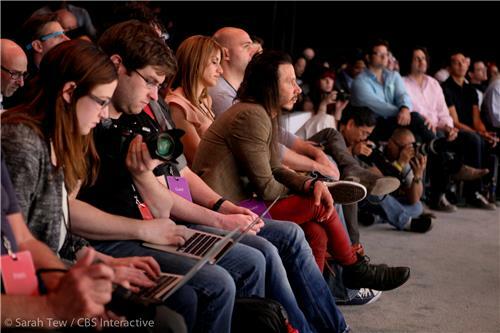 Today he says he's representing "all of Microsoft" and not just the Surface team. He says that people "pushing him on" gets the team excited. "Our first catchphrase was click in and do more. We had this vision, this dream, and we wanted to push forward with this tablet... and how people can get more done with it." 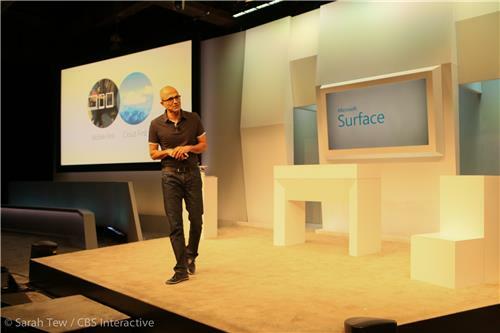 "And then we launched Surface 2 and Pro 2 and some of you started to write nice things!" He says that's helpful, and we can imagine how that would be. "It was a good step forward and a good start."